Precision Applications, LLC is a full-service firearms training school based out of Dallas, GA.
We utilize numerous different facilities and ranges in the Southeastern United States, including Tennessee and South Carolina, as well as several in Georgia. We have access to everything from indoor training venue to rifle ranges that are close to 1.5 miles long. Our cadre of Instructors have over 200 years of combined experience in the military, law enforcement, competitive shooting, and Instruction. 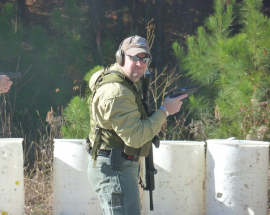 Whatever tactical subject matter interests you, we have the Instructors to teach it. Whether you are military, law enforcement, or civilian, Precision Applications, LLC has the courses and Instructors to increase your skills, or teach you new ones. Precision Applications, LLC - Training America, one shooter at a time!